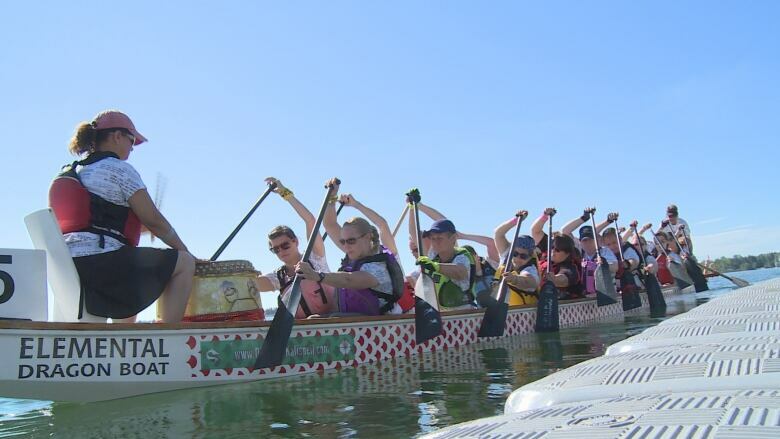 Sandra Mena was pumped to participate in the Calgary Dragon Boat Race and Festival this weekend. 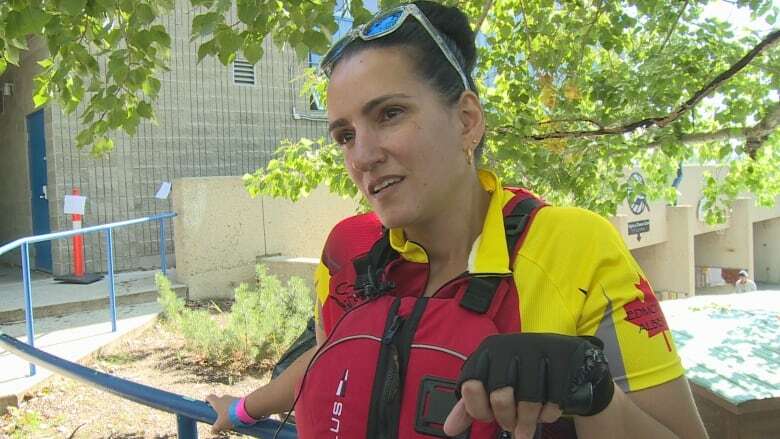 “I liked water sports so I thought why not learn something new,” Mena told CBC News Sunday afternoon. Sandra Mena says when she's in a dragon boat, paddling to the rhythm of the drummer, she feels a bond with her teammates. It's about being an equal. 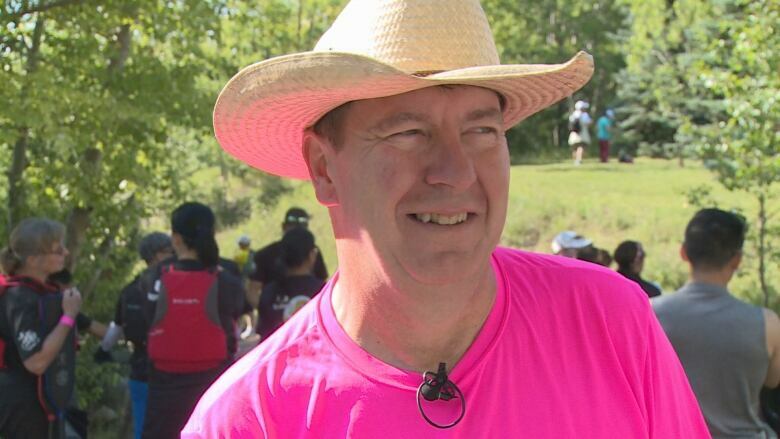 Mena was one of hundreds of participants at the Calgary Dragon Boat Race and Festival this weekend. "I liked watersports so I thought, 'why not learn something new?'" Mena told CBC News Sunday afternoon. "It's addictive. It is just a wonderful sport, very inclusive, community and supportive." She says not being able to see does have its benefits. "When you can't [see], you kind of keep your head in the game and in the boat and just focused on the race. So I actually find it a bit of a benefit not to be able to look around and see what's going on and be threatened or intimidated by what's around you, as opposed to just focusing on what you need to do to get to the end of the race." Organizer Joe Connelly says inclusion is just one of the goals of the annual festival. "This is our 25th anniversary and this year we have got something for everyone, including some great sunshine," Connelly said. "It is a bit of an addictive sport actually. You find that people get in it on a fun basis, on a team-building basis, but then it does become a little bit addicting. When you are out in the water and paddling hard, there is nothing like that. It is a lot of fun." With 58 teams competing this year, they are getting close to the Glenmore Reservoir venue's capacity of about 70 teams, Connelly said. He says each boat has about 22 competitors. "There is quite a few people in the water and quite a bit of excitement," he said. "When the horn goes off and they all dig in for that first paddle and you kind of feel the boat jump a bit, it is very exciting." Meanwhile, Sandra Mena says she doesn't feel any different from her team members who can see. "Once you are on the boat you are equal to everyone else," Mena said. "There is vision, no vision. It doesn't make a difference because that is not what is getting you to the finish line," she said. "It's just technique and everything else — the cohesion of the team."